Have you ever had trouble hearing in a congested room or restaurant but can hear just fine at home? Do you have particular difficulty hearing higher-pitched voices or TV dialogue? If so, you may have hearing loss, and hearing aids may be able to help you. But how exactly do hearing aids work? Are they simple amplifiers, or something more complex? This week we’ll be focusing on how hearing aids work and how they are a bit more sophisticated than many people realize. But first, let’s start with how normal hearing works. The hearing process starts with sound. Sound is simply a type of energy that travels in waves, like ripples in a lake. Things make sound in the environment when they generate vibrations in the air, and those vibrations are ultimately caught and sent to the ear canal by the outer ear. Immediately after passing through the ear canal, the sound vibrations hit the eardrum. The eardrum then vibrates, creating and amplifying the original signal which is then transmitted by the middle ear bones to the snail-shaped organ of the middle ear named the cochlea. The cochlea is filled with fluid and small nerve cells called cilia. The vibrations transmitted from the middle ear bones agitate the fluid and stimulate the cilia. The cilia then conduct electrical signals to the brain and the brain interprets the signals as sound. With most instances of noise-induced hearing loss, there is injury to the cilia. So, the inbound signal to the brain is compromised and sounds appear quieter or muffled. But not all sound frequencies are uniformly weakened. Typically, the higher-pitched sounds, such as speech, are impacted to a greater extent. In a noisy setting, like a restaurant, your capacity to hear speech is impaired because your brain is obtaining a weakened signal for high-frequency sounds. Simultaneously, background noise, which is low-frequency, is getting through normally, drowning out the speech. You can see that the solution is not simply amplifying all sound. If you were to do that, you’d just continue drowning out speech as the background noise grows to be louder relative to the speech sounds. The solution is selective amplification of only the sound frequencies you have trouble hearing. And that is only possible by having your hearing professionally assessed and your hearing aids professionally programmed to enhance these specific frequencies. Present day hearing aids consist of five interior parts: the microphone, amplifier, speaker, battery, and computer chip. But hearing aids are not just straightforward amplifiers—they’re sophisticated electronic devices that modify the characteristics of sound. This takes place by way of the computer chip. Everyone’s hearing is one-of-a-kind, like a fingerprint, and so the frequencies you need amplified will differ. The amazing part is, those frequencies can be ascertained precisely with a professional hearing test, technically known as an audiogram. Once your hearing professional has these numbers, your hearing aid can be custom-programmed to enhance the frequencies you have the most difficulty with, maximizing speech recognition in the process. Here’s how it works: the hearing aid picks up sound in the environment with the microphone and transfers the sound to the computer chip. The computer chip then translates the sound into digital information so that it can differentiate between different frequencies. Then, depending on the programmed settings, the high-frequency sounds are enhanced, the low-frequency background sounds are repressed, and the refined sound is served to your ear via the speaker. While your hearing will not completely go back to normal, that shouldn’t stop you from obtaining significant gains in your hearing. For virtually all people, the amplification supplied is all they require to comprehend speech and indulge in productive and effortless communication. Think of it this way. If your eye doctor told you they could improve your vision from 20/80 to 20/25, would you forgo prescription glasses because you couldn’t get to 20/20? Of course not; you’d be able to function perfectly with 20/25 vision and the gain from 20/80 would be considerable. 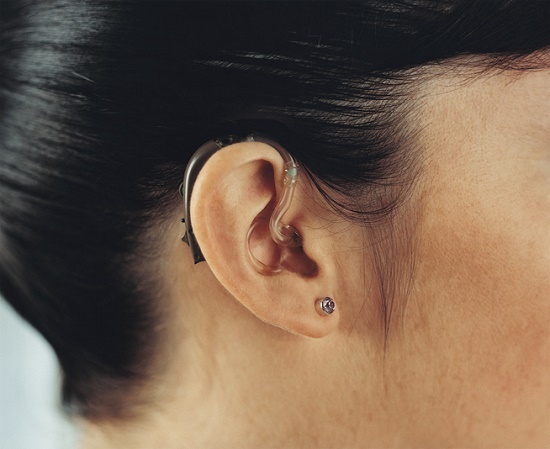 Are you set to find out the improvements you can achieve with contemporary hearing aids? Call us today!